By cooking and freezing in advance you’ll never be stuck for meals when they’re needed in a jiffy. “Mom, what’s for supper?” This question is enough to make you panicky, especially if it’s nearly suppertime and you haven’t had time to even think about food. Frozen food is the solution to this problem. It requires minimal planning and the possibilities are endless. Mince is versatile and can serve as a basis for a variety of dishes. If you cook and freeze mince beforehand it can save a lot of time in the kitchen. 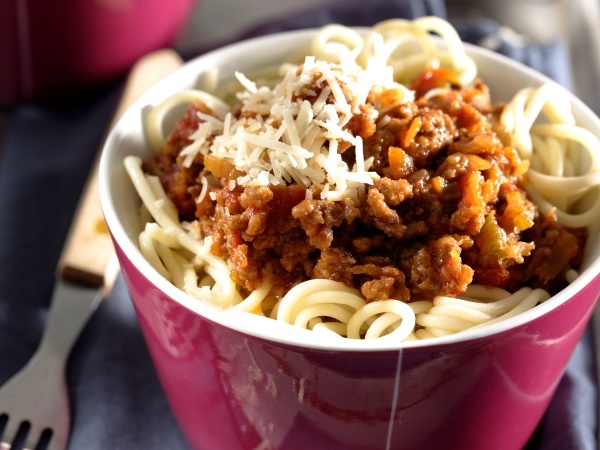 Use a simple curried mince or Bolognese recipe and double or triple it. Fry the onions and garlic in the oil. Add the rest of the ingredients and fry. Prepare a pot of the mince mixture, let it cool, divide it into portions and freeze it. Cooked mince can be frozen for two to three months. Bobotie – Spoon the mince mixture into an ovenproof dish, make a simple egg custard and pour it over the mince, add a few bay leaves and bake until heated through and set. Vetkoek with curried mince – Heat the mince in a saucepan, add a cup of peas, heat and fill the vetkoek with the mixture. Curried shepherd’s pie – Mix a few grated carrots with the mince, spoon into an ovenproof dish, cover with mashed potatoes or mashed vegetables (a mixture of mashed potatoes and pumpkin or carrots) and bake in the oven until heated through. Fry the onion, garlic, celery and carrot in the oil and butter. Add the mince and fry till cooked. Add the rest of the ingredients and bring to a boil. Lower the heat and simmer for 40 to 50 minutes before adding the spices. Lasagne – Make a simple white sauce, arrange layers of lasagne sheets, mince and white sauce in an ovenproof dish, ending with white sauce and cheese. Bake in the oven until done. Bolognese pizza – Spread the mince over a prepared pizza base, arrange a few halved cherry tomatoes on the mince, sprinkle with cheese and bake in the oven until done. Sprinkle with fresh basil and slice. Tomato soup – Heat the mince, a can of chopped tomatoes and 1 litre of beef stock in a pot, season with sugar, salt and freshly ground black pepper and bring to the boil. Serve with toast. Cooked, shredded chicken is versatile and good for freezing. Just add a sauce or a few ingredients for a meal in a moment. Prepare an extra chicken or chicken portions next time you cook. Let the chicken cool completely, remove the bones, coarsely shred the chicken and freeze in portions. Cooked, deboned, shredded chicken can be frozen for up to three months. Preheat the oven to 230°C. Fry the onions and thyme on a low heat in the butter until caramelised. Let the mixture cool completely and mix it with the bread crumbs. Add salt and pepper to taste. Stuff the chicken with the mixture and rub it with olive oil and the spices. Put it in an oven dish with the garlic and add the stock. Roast the chicken for 20 minutes before lowering the heat to 160°C and roasting for another hour or until done. Pasta dishes – Add your favourite pasta sauce to the chicken, heat and mix with cooked pasta. Pies – Fry an onion, garlic and mushrooms and add the cooked chicken and a little stock. Thicken with a bit of cornflour and spoon into a pie dish. Cover the chicken mixture with flaky pastry and bake in the oven until golden brown and done. Chicken sandwiches – Spoil your family with sandwiches made using chicken, mayonnaise and cheese or any other fillings. Grill the sandwiches until the chicken is hot and the cheese has melted. Don’t cook only to freeze; double or triple a recipe and serve one meal immediately. Let the rest cool, divide it into portions and freeze. Frozen food needs a little more seasoning (spices, salt and pepper and so forth) because the flavour tends to weaken after defrosting. Make sure the cooked, prepared food has cooled completely before freezing it. Defrost frozen food overnight in the fridge for use the next day. Don’t freeze potatoes, egg custard or large pieces of meat. Freeze food in airtight containers or freezer bowls or wrap it well in aluminium foil and/or clingfilm. Mark the bowl/bag with the date on which the food was frozen.